trading faces: Christina Crawford on Bobbi Kris: "My childhood wasn't so bad after all." Christina Crawford on Bobbi Kris: "My childhood wasn't so bad after all." 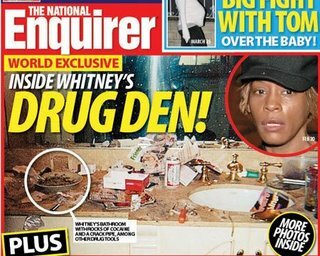 "Whitney, do YOU think this bathroom is clean?" J.C. has a can of Bon Ami with your name on it, girl. I was wondering when you will publish a comment on Whitney. Very funny! I love Whitney, and she can do no wrong in my eyes. Actually, I'd love to get high with her - haha. Waaaaaay back when, when I was doing drag, my friend Anjelica del Rio did a dueling "I Will Always Love You" number with her as Whitney and me as Dolly. When she stole the big finale from me, I stepped off stage, got a machine gun, and mowed her down, finishing the number with my heel on her head. It was a beautiful moment in my brief career.